Welcome to nature, peace and paradise and our amazing small towns at the heart of it all. Just two hours from Queenstown airport, the beautiful little town of Te Anau and the neighbouring village of Manapouri (a few kilometres south) are at the heart of Fiordland, New Zealand's largest national park with world heritage status. Te Anau and Manapouri are where you base yourself if visiting Fiordland, and this is where Fiordlanders live. 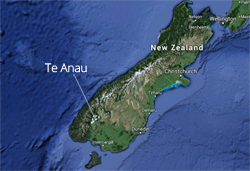 Te Anau and Manapouri are the only towns next to the national park. Both Te Anau and Manapouri are built on the shores of massive, pristine lakes (Lake Te Anau and Lake Manapouri) that are part of the national park; so just dip your toe in the water of our lakes and you are already in the national park. From Te Anau town centre you can walk around the lake front and on to the famous Kepler track. Te Anau and Manapouri are the gateways to our incredible and world-famous fiords at Milford Sound and Doubtful Sound, where you can enjoy a boat cruise or kayak. As well as being right next to the Kepler track, Te Anau is also at the start of the Milford Road; the only road to Milford Sound and the start of the Milford Track. Manapouri is the start of the journey to Doubtful Sound, our equally beautiful fiord further south. If you want to visit these fiords, or more of our stunning fiords further south, or walk our tracks, then you need to base yourself in Te Anau or Manapouri. Beautiful Lake Te Anau is the largest volume of fresh water in Australasia, with stunning views of the Kepler and Murchison Mountains, three inland fiords stretching like fingers to the west of the town, and beautiful beaches and lake front walks. Manapouri, situated on the shores of Lake Manapouri (connected to Lake Te Anau by the awesome Waiau River) is also a stunning location. Lake Manapouri is described as the most beautiful lake in New Zealand, with its beaches, islands, and jaw-dropping views of the iconic Mount Titiroa at 1,715m. Lakes Te Anau and Manapouri and rivers flowing in and out of them give access to some of the best trout fishing in the world, and endless boat cruise and kayaking and sailing opportunities. You don't see introduced pine trees on our mountains. Our towns look over primeval podocarp and native beech forests, and soaring mountain peaks, full of rare birds such as the very endangered takahe. If you want a wilderness experience, then Fiordland is the place to do it. As well as the Milford, Kepler and Routeburn tracks, there are off-track wilderness adventures and hunting opportunities and plenty of places to trail run. 1 Visit the fiords at Milford and Doubtful Sound. 2 Go for a stroll or jog on the first section of the Kepler track in Fiordland National Park. It starts right from Te Anau. 3 Get off track on a guided half or one-day off-track wilderness walk with a qualified bush guide in the National Park. Trips start from Te Anau. 4 Walk along te Anau's lake front to see the incredibly-rare takahe bird in our bird park. 5 Cruise around beautiful Lake Manapouri's beaches and islands, and cruise Lake Te Anau's three stunning inland fiords. 6 Head up into the skies for a Fiordland adventure in one of our helicopters or planes. 7 Play golf on Te Anau's amazing golf course with a million dollar lake and mountain view. 8 Raining? Go see Ata Whenua, our amazing movie about Fiordland, shot from a helicopter. Screenings daily. 9 Visit our incredible glow worm caves - trips leave daily from the lake front in Te Anau. 10 Reeeelaaaax. This is the perfect place to escape the pollution and noise of larger towns and simply sip a coffee, listen to the birds trill and gaze in awe at our amazing world heritage views.